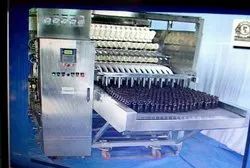 Unipack Machines Linear Bottle Washing Machine have developed updated version design which ensures cleaning of round shaped gloss and pet bottles efficiently with air and vacuum facility. This is the new feature added in our existing machine. New design has added features which result in to ease of operation and user’s friendly. 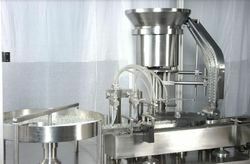 Linear bottle machines giving output from 90 bottles/minute to 225 bottles/minute with eight wash cycles are available. 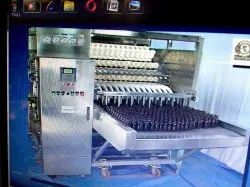 All machines operations are simple and due to flexibility in adopting different size of bottles with bare minimum time for changeover from one size to another size, better efficiency and productivity are ensured. Periodical maintenance schedule given in the technical manual gives trouble free performance throughout the life of machine. List of our esteemed customers. 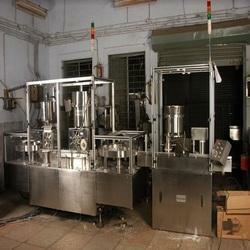 Our organization is renowned among the eminent manufacturers and suppliers of a wide assortment of Linear Vial Washing Machine. With the help of ultra-modern machinery and cutting-edge technology, our professionals manufactured these machines using the best grade raw material sourced from the authentic vendors of the market. Owing to optimum efficiency, excellent performance and high durability, this machine is widely acclaimed all across the nation. Clients can avail the offered range from us at market leading prices. Wash cycle 3 Nos. internal liquid + 3 Nos. internal air +1 No external air + 1 No. external liquid. ( Wash cycle can be changed to suit customer’s specific requirement. Optional Equipments Hydraulic loading table, Bottom Lighted Inspection table, Turn Table, Out feed wire mesh conveyor. Vial size washing Round shaped 2 ml to 100 ml with minimum set of change parts. 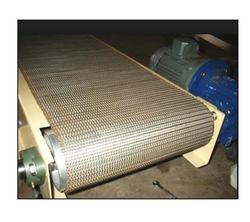 With rich industry experience, we are manufacturing and supplying a wide assortment of Stainless Steel Wire Mesh Conveyor. Manufactured using optimum quality raw material and sophisticated technology, our offered range is well known for corrosion resistance, high accuracy, durable finish, robust construction and other features. Considered ideal for various applications, the offered conveyor is in compliance with the international quality standards. We provide this product in several sizes and finish to meet clients’ varied needs.